Maine and the Greater Bangor area provide the best of all four seasons. Although the calendar says spring begins near the end of March, the season doesn't really begin until about a month later, near late April. Significant snowfall in late March and early April is not uncommon and is expected. But once the air becomes warmer and the mud dries from the thaw, spring arrives just in time to lift anybody's spirits. The one sure sign that spring has arrived is the musty yet sweet scent of a mid-April shower. By late March, Maine's rivers and streams begin to clear of ice from the long winter. Large ice floes in the Kenduskeag Stream, which runs through downtown Bangor, crack and creak before splitting apart and chaffing the stream's banks as they head slowly to the Penobscot River. The spring thaw along the Kenduskeag increases the stream's water level by several feet. 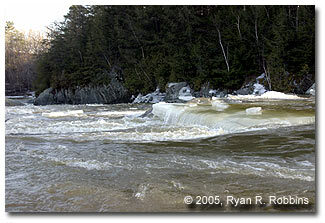 When the last ice floes wash out to the Penobscot or melt, the Kenduskeag rushes for the river and the open sea. Canoeists and kayakers throughout the area take advantage of the white water produced by the thaw in the annual Kenduskeag Stream Canoe Race, held the third Saturday of April. Late April and early May tend to be windy. The temperature reaches 50 degrees consistently by the end of April, and sometimes it reaches the upper-60s with perhaps one day in the lower-70s. At about mid-May, the temperature reaches 60 degrees consistently. Evenings and nights, however, tend to be in the upper-40s. 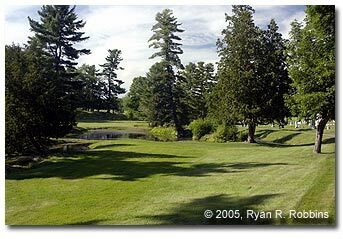 Depending on the temperature, trees may begin to bloom in the first week of May, or they may not bloom until the middle of the month, or even later. But there is always that one day when you wake up and the trees are full of leaves and you wonder when it happened. June brings more stable weather and temperatures. The winds of April and May are gone, replaced by nothing but warm sunshine. The temperature reaches the lower- to mid-70s during the day and the mid-50s at night. July is Maine's hottest month, with an average high of 79 degrees. But as visitors in 2001 found out, the state is not immune from the searing heat that so often afflicts the southern states. Heat waves -- in which there are three consecutive days of temperatures of at least 90 -- are not common. Also, a string of high-80s with a few 90s thrown in is not uncommon. The evenings and nights in July are comfortably warm -- or cool, depending on your perspective -- with temperatures in the lower-60s. August is probably the most humid month of the year. The high temperature is consistently in the mid- to upper-70s. But evenings and nights become increasingly cooler, with lows dropping into the lower 50s and even upper 40s in some spots. The increasing difference in temperature between night and day often causes a light fog to seep in on most nights and early mornings. By the end of August, the weather tends to fluctuate widely from day to day. One day it might be 85 degrees with bright sunshine and high humidity. The next day may be overcast, rainy, with a high of 65 and a steady breeze. Although hurricane season generally affects only the southeastern and mid-Atlantic states, Maine does get the remnants of the stronger hurricanes that affect that part of the country. But usually the state gets only rain and some wind. September is a transition month. The humidity fades away and the air becomes drier. The first half of the month is often warm during the day and somewhat cool at night. But as daylight continues to wane, trees begin storing chlorophyll for the upcoming winter. The leaves change colors first in Aroostook County, around the middle of the month. The change gradually makes its way south, reaching the Bangor area at about the third week of the month. By the end of the month, the high temperature is about the mid-60s, with lows dropping into the high- to mid-30s. The coming of October brings peak fall foliage season in Bangor. It is difficult to predict how the foliage will turn out, though. 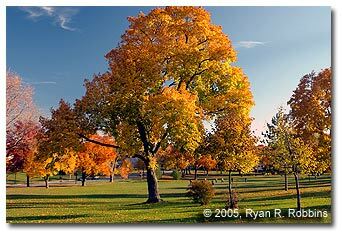 Despite enduring droughts in summer 1999 and 2001, trees still provided good leaf-peeping. The high temperature drops throughout the month, going from late-September's 60s to the 50s. You will definitely want a jacket with you when heading out this month. Late-night frosts become more common and you may find that your vehicle's defroster needs just a little bit more time to evaporate the thin crust of slushy moisture that invariably forms on the windshield and rear window during the night. The weather becomes increasingly unstable the further you head into the fall, with November mimicking March's sometimes unpredictable weather, only without as much snow. The air becomes much drier than October's and the nights feature biting chills, with temperatures in the 30s and even 20s. In the day, the temperature may be in the upper-30s to lower-40s. However, don't rule out a day or two with the temperature reaching into the upper-40s, 50s or even lower 60s. By this time, the leaves have long since fallen from the trees and firearm deer hunting season is in full swing. Mornings are often cold and dreary. Any snowfall will likely melt within a day or two in the Greater Bangor region, although snowfall in Aroostook County tends to stick around. Recent Decembers have featured fickle weather. In 2001, temperatures throughout the state reached the mid-60s in the first week of the month. Whether there will be snow for Christmas is often a crap shoot to decide for meteorologists until as late as a week before the holiday. Unusually mild temperatures aside at the beginning of the month, a normal high is in the lower- to mid-30s with lows in the low-20s and teens without ruling out single-digit lows. 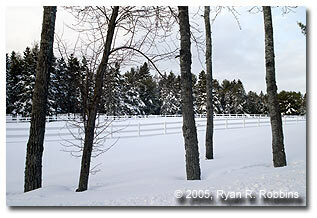 January and February are prime winter months in Maine. January is generally the coldest month, with highs reaching only the low-30s but hitting the upper-20s more often than not. Lows tend to be in the low teens or single digits. It is not uncommon for the low to drop below zero. February sees a slight increase in the temperature, with highs in the lower-30s and lows remaining in the teens and even single digits. However, the slight increase in temperature makes conditions ripe for higher humidity and a greater chance of snow, making February the snowiest month. Powerful snowstorms -- called nor'easters -- that get their fuel from moist air over the Atlantic Ocean are most common in February to late March. Nor'easters often form in large blobs just north of New York state and ride the jet stream up the coast, gathering momentum from the Atlantic air and dumping up to 2 feet or even 3 feet of snow at times. The Maine Department of Transportation and public works crews throughout the state's cities and towns are always prepared for the worst winter weather. More often than not, Interstate 95 is the safest road to be on during a snowstorm -- if you drive at a safe speed. A good set of all-weather tires is all that is necessary for traction. The Transportation Department patrols the interstate nightly throughout the winter, reporting weather and road conditions for the department's Web site and road conditions hotline. The patrols also help stranded motorists.